"Hi, I'm Carla-15. I'm a driverless car. Do you want to see what I do at night?" So begins the new children's book from moovel labs. The aim is to familiarise children in simple terms with the complex concept of autonomous driving. What have children's reactions been? "Driverless cars are like unicorns - you only get them in stories. They don't exist!" explains young Sophie. Julian is also clear where he stands: "It's just a book. It's not real," he says. The children's reactions were recorded during a project week for pre-school children in Stuttgart. They show just how new the concept of autonomous driving is, even for the youngest members of society. Many people still find it difficult to believe the fact that there are going to be driverless cars on the road in the near future. Sven Beiker, lecturer at Stanford University and mobility advisor at McKinsey, sees things differently: "I believe that we will see these mobility services in operation in city centres during this decade – in other words before 2020." It's high time to start familiarising the next generation with the complex topic of autonomous driving and the various possibilities it offers. And the best way to do that? In a children's book. 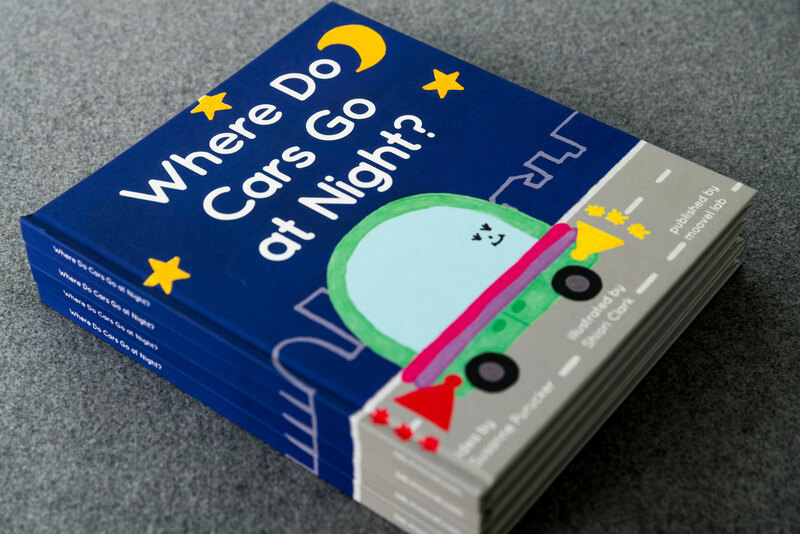 moovel lab launched the English language book, entitled "Where Do Cars Go At Night?" at the Frankfurt Book Fair in October 2016. moovel lab is Daimler mobility service subsidiary moovel's future lab. So where DO cars go at night? According to moovel lab, cars no longer sit unused in parking spaces or in garages at night. Carla-15 in the picture book has a busy time carrying goods, cleaning the streets and watering plants. These are just a few examples of the wealth of options for driverless cars and trucks. Rush hour tailbacks caused by refuse collection vehicles and post vehicles would be a thing of the past. Autonomous vehicles could simply empty the bins or deliver parcels at night, when everyone's asleep and they're not disturbing anyone. The key advantage of this future concept is the protection it offers for the environment. The volume of traffic could be dramatically cut and CO2 emissions significantly reduced. Carla-15 is, of course, an electrically powered vehicle, producing no local emissions. In the coming years, charging stations such as the one Carla-15 uses in the book when she wants to relax, are something that youngsters will come across more and more frequently in the real world. It's not just at night that the way vehicles are used is set to change. In moovel lab's children's book there are no real car owners any more. Anyone can use an available car to go to work or an appointment – car sharing is the order of the day. And the mobility researchers at moovel lab envisage another change: "Cars don't need parking garages any more" according to the book. The areas can be used for other purposes – for example for a park. The child-friendly illustrations and graphics make it easy for children to understand how certain processes will work in the future. Looking at a girl in the book with a flashing device in her hand, kindergarten pupil Lukas instantly knew what was happening: "The remote control is calling the cars so that they come," he explained. When asked "Which car is going to come? ", Lukas pointed to different cars. "No, that's too far away," announced Laura, sitting next to him. Without knowing it, she had intuitively grasped the logic behind the system. Mia, a pupil at the International School in Stuttgart, already understood that "autonomous driving" wasn't quite as fictional as unicorns: "Now it seems funny, but when we're grown up it'll be totally normal," she asserted. Of course moovel cannot predict exactly how autonomous and networked mobility will develop over the coming years. But the book is designed to familiarise children with the concept and encourage them to think. In one Stuttgart kindergarten, for example, the pupils had a heated debate about whether Carla-15 was a better driver than their own parents.